The visitor center with our cars attracting some onlookers. 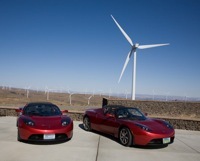 Our Roadster perched over a row of windmills. Our and Scott's Roadsters in front of windmills with Mt. Rainier in the background. The windmills are quite large, 200 feet tall! The visitor center conference room. 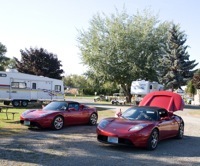 Charging at the Ellensburg KOA Kampground. We're plugged into adjacent hook-ups. Scott's charger was getting hot, so we swapped sides and Scott improvised a method for holding the lid open to impove cooling of the aging electrical box. Charging criss-crossed with the electrical box lid held open.